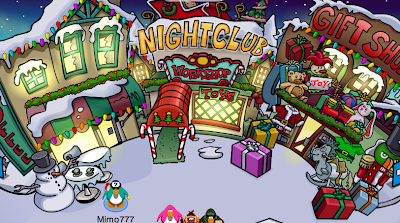 Club Penguin Cheats by Mimo777 Club Penguin Cheats by Mimo777: 2010 Club Penguin Holiday Party Cheats and FREE Items! 2010 Club Penguin Holiday Party Cheats and FREE Items! The Christmas Party is here! Woot! 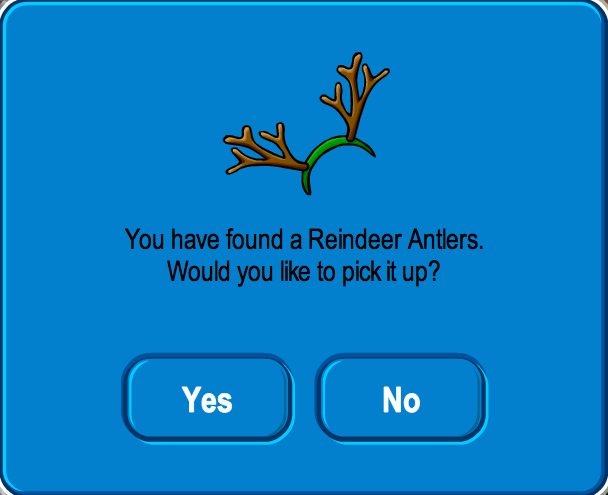 First, to get the FREE Reindeer Antlers go to the Ski Village. Too bad this item is old, huh? Here is how you get the Members Free item cheat, the Toy Bag! Step 2. Go into the Santa Sled. And here is your reward! A Santa's Present Bag! I miss the little tree on the Iceburg and the HUGE tree in the Forest, don't you? You can get to this room on the path in the lower corners of the Town or Plaza. Let me know if you find other coolness! I found the big tree!!! It is off of the forest!!! When you click the santa's sleigh flyer, it says become a real pirate and it takes you to the cove!! Antlers again. Santa sled again. Im really mad there is allot of rooms without nothing im really angry las years party were better. Throw a snowball at the mysterious tree weird room and you throw ornaments! Actually, Mimo just updated it! If you throw a snowball in the new secret room, it turns into an ornament, so you can decorate the trees! Did you see the fire extingushers near every Christmas tree? Last year, they had the gigantic tree in the forest, and a fire truck was one of the presents! I think I know why Club Penguin took that gigantic tree off. It's because of the new entrance to the Mine. I loved that tree. 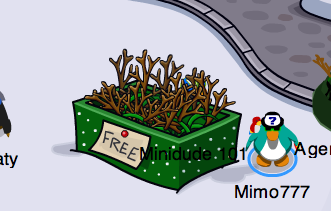 Waddle on, Mimo! I think this room is going to be the town center! i just found something really cool! if somones igggy is on the map, you can get there withought getting to the map, and not being their buddy! if any penguins iggy is on the map, you can click on the house icon without being their buddy. I found that in Rockhoppers Quarters on the board the goal is to FILL the lighthouse with coins! Then if you go to the beacon, theres a sign on the roof that says GOAL. That means by the end of the party, the lighthouse will probably be FLOODED with coins! 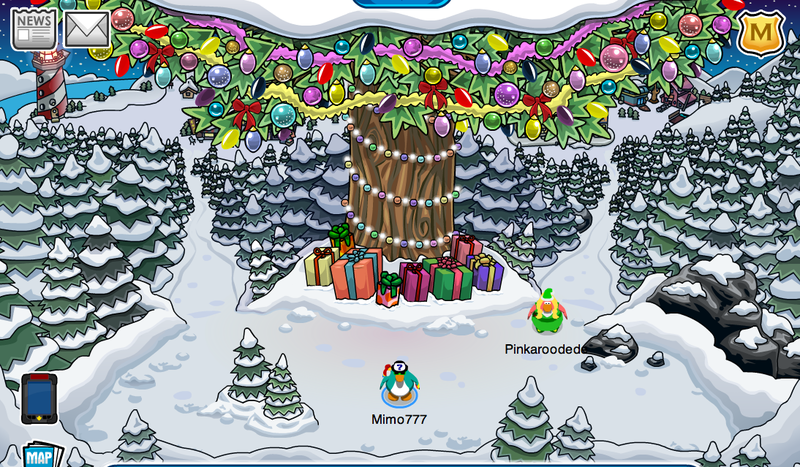 Theres another HUGE christmas tree in the ski lodge !!! I found out that the double santa beard glitch, isn't a glitch! If you buy the new one, it becomes a "FACE' item, the old one is a "NECK" item! I'm not sure about the other glitch, but the new beard was made so we can have the beard, and the santa sack. I think that's quite cool. The new room is obviously the Town Center you told us about. The room with the fountain and notice board? I bet it's going to stay! I got some other coolnes. you know you need flash to play CP, right? 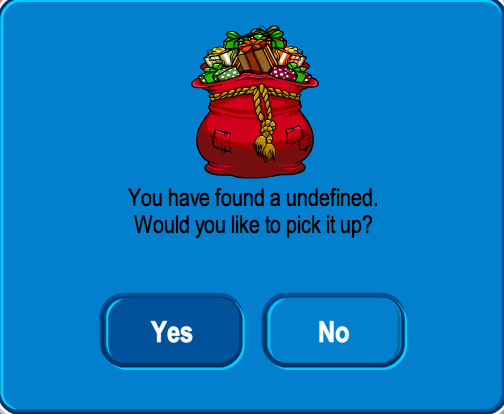 Now, if you enter CP on iphone, you see a picture with a penguin and many cute puffles. Now take an iphone and check it out. is the new room for non members too? I hope the room will stay. Maybe it is going to be that Town Center room. This isn't a cheat. Club Penguin updated it about a week ago for more convenience for penguins holding parties. I think it's the room with the message board, the fountain and the gazebo before some construction! Remember when Mimo showed us that news room thing and the town was in the background?, THIS ROOM MIGHT BE IT AFTER THE PARTY! Well, not as huge as last year's. Remember? It didn't fit in the Ski Lodge so they cut a part of the ceiling and it reached the ATTIC!! I think it will be this room too. That room does look cool! Smoove cheats, as always! And here's one more thing: If you go to the Ski Village and look to the left of the Christmas tree at the top, you'll see a miniature version of one of the robots that you have to defeat in the first EPF game! This is the room that was posted ages ago, the town centre. I recognize it from the picture!!! when your throwing a snowball in the lighthouse it turns into a coin! I've found thoose hats, I dont like them that much, i mean there is alot of none member hats and there is another one ? Rockhopper gave anotherone too. none members need more shirts. And not only hats and just SOME time shoes. anybody notice if you threw a snowball in the lighthouse it becomes a coin? Wait so this is a new room? I have been waiting for a new room. Also is there really a Town Common like in that book you showed us? I dont know if you know this mimo but i know how to get 100% for hiding in the epf test.Easy first go to a hiding place(i heard that the back of a pole on the front is good)then after that you throw a SNOWBALL at camera nuber 2 and stay there and wait. I found that if you press the + button or the - button then you can change the quality and when you sit down the pupil of your eyeball dissappears!Everyone looks silly!!! Try it and you will burst out laughing!!! Hey u know the room with the big tree can be the new room which is the "Town Center" i mean if u got the awsome offical guide to club penguin go on the whats new page and in the background is the town so u never know but im sure cuz it says "???" when u go into the room so it might be a suprise. Internet is without doubt one of the few markets on the planet by which folks can start business with little money and make an entire and successful.